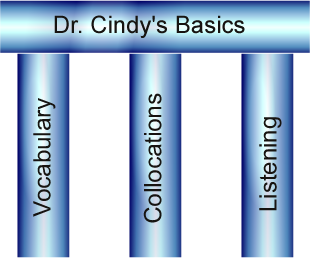 Regardless of your previous English knowledge or field of interest, ALL of Dr.Cindy’s students must FIRST go through DR. CINDY’S BASICS which is based on three pillars: VOCABULARY, COLLOCATIONS, and LISTENING. Once you have gone through the basics, there are PEN EXERCISES and LISTENING EXERCISES to APPLY and PRACTICE what you have learned. If you jump straight to the exercises without going through the basics, you will most likely miss out on some important information and decrease your learning efficiency. You don’t want to do that, do you? Go now to Dr.Cindy’s Basics! Note: You must be officially matriculated as a student or signed up as an Expert English Follower (EEF) to use this part of the website.